An optical diffuser is an element that scatters light and is commonly used to soften or shape illumination. In this paper, we propose a novel depth estimation method that places a diffuser in the scene prior to image capture. We call this approach depth-from-diffusion (DFDiff). We show that DFDiff is analogous to conventional depth-from-defocus (DFD), where the scatter angle of the diffuser determines the effective aperture of the system. 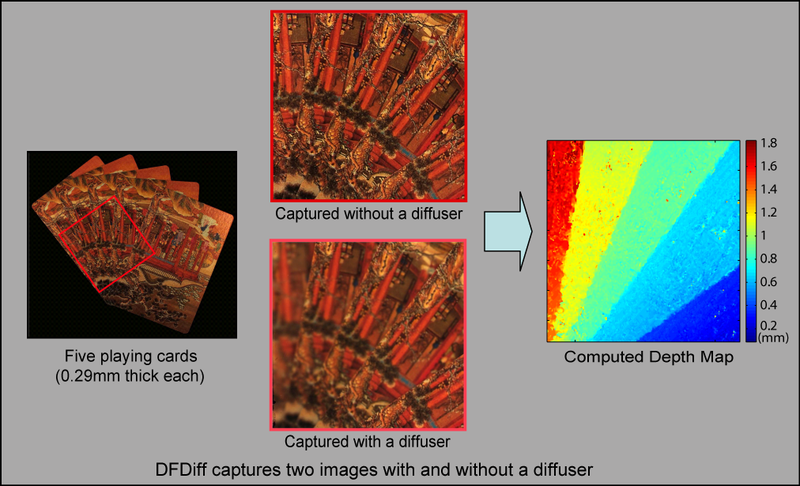 The main benefit of DFDiff is that while DFD requires very large apertures to improve depth sensitivity, DFDiff only requires an increase in the diffusion angle – a much less expensive proposition. 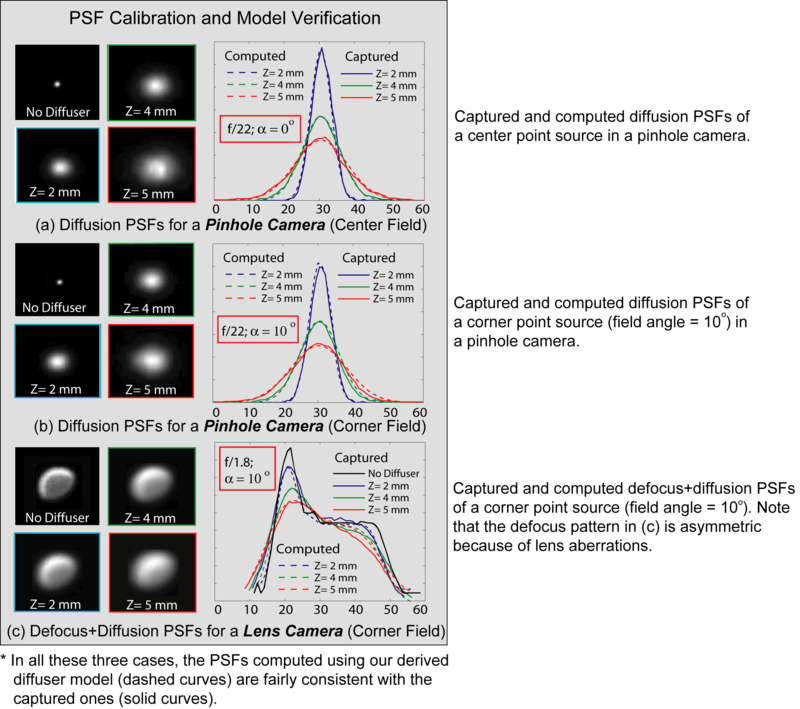 We perform a detailed analysis of the image formation properties of a DFDiff system, and show a variety of examples demonstrating greater precision in depth estimation when using DFDiff. A diffuser is an optical element that scatters light and is widely used to soften or shape light in illumination and display applications. Most commercially available diffusers are implemented as a refractive element with a random surface profile. When a diffuser is placed between a camera and an object, the captured image will appear blurred, where the amount of blurring is proportional to the object-diffuser distance. From the amount that an object is diffused, we can infer its depth. The image formation model with a diffuser placed between the camera and the scene is carefully studied in this project. For a pinhole camera, we prove that the pinhole-diffuser distance U, the object-diffuser distance Z, and the diffuser size on the diffuser AB follow a diffusion law, which has a similar form as the Gaussian lens law. In particular, for a given image magnification (U+Z)/V, the blur size on the sensor r is proportional to the object-diffuser distance Z. It should also be noted that tilting the diffuser by a small angle will not change the blur size r, as long as the projection center C is not changed. For a lens camera, the blur in the image is caused by a combination of lens defocus and diffusion due to the diffuser. It is proved that the overall blur kernel is the convolution of the defocus kernel and the diffusion kernel. Diffusion due to a diffuser is shown to be equivalent to lens defocus. The diameter of the virtual aperture A'B' is proportional to the diffusion angle and the diffuser-lens distance. This equivalence implies that most depth from defocus (DFD) algorithms can also be used for depth from diffusion (DFDiff). 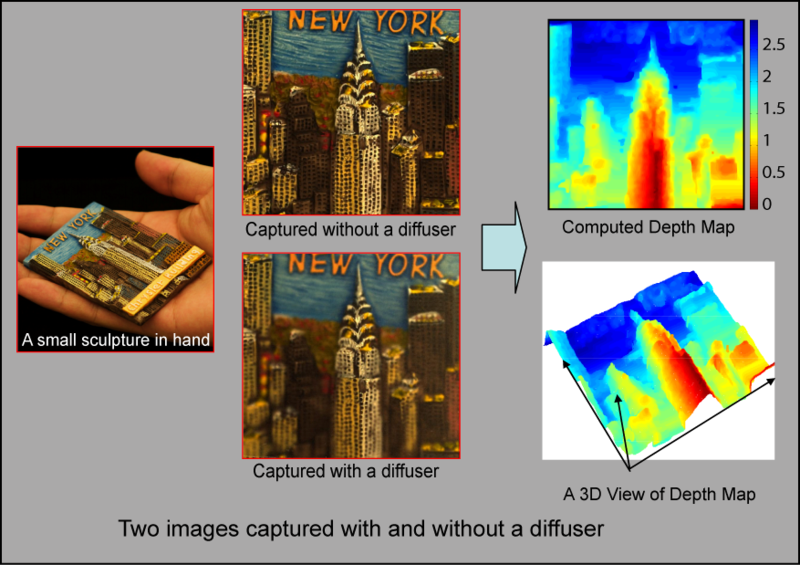 DFDiff is able to achieve a high precision depth estimation without a large lens. 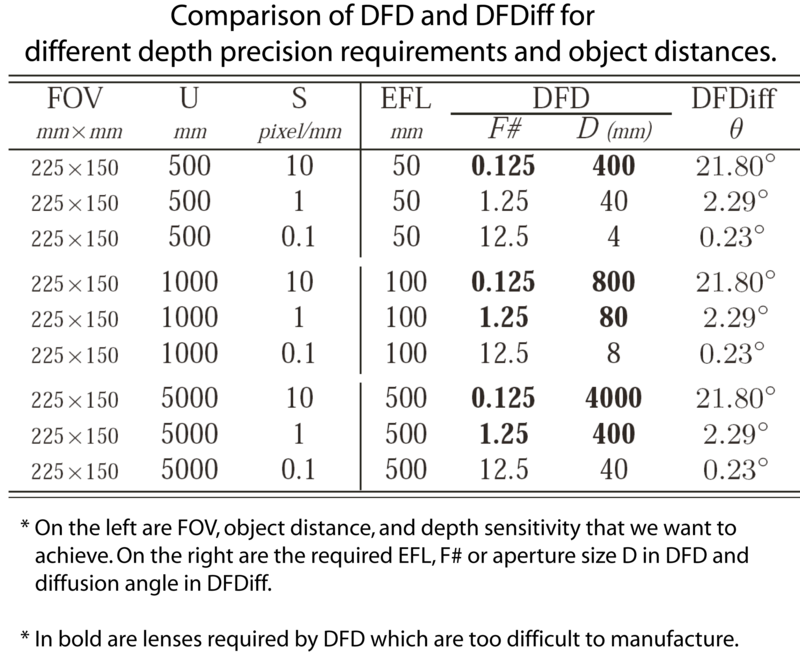 For a given image magnification, the depth sensitivity of DFD is proportional to aperture size and inversely proportional to the object-camera distance. Meanwhile, the depth sensitivity of DFDiff is proportional to the diffusion angle and is independent of the object distance. Note that large angle diffusers are much cheaper to manufacture than large aperture lenses. 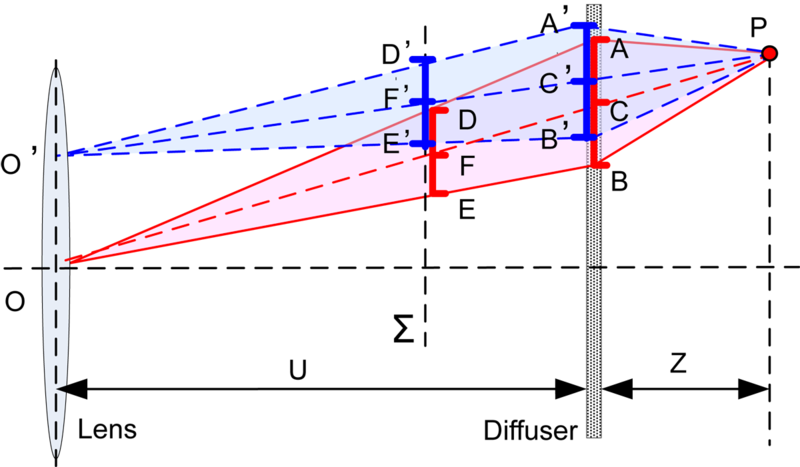 Lens aberrations cause the shape of the defocus point spread function (PSF) to vary with field position. This effect is strong, particularly in the case of inexpensive lenses, and degrades the precision of depth estimation. In contrast, we show that diffusion PSFs are more invariant to field position. Even a low-end consumer camera can be used for high precision depth estimation, when coupled with an appropriate diffuser. DFDiff results for five playing cards, each of which was only 0.29mm thick. A Canon EOS 20D camera and a 20 degree Gaussian diffuser were used. DFDiff results for a thin sculpture. A Canon G5 camera and a five degree Gaussian diffuser were used. 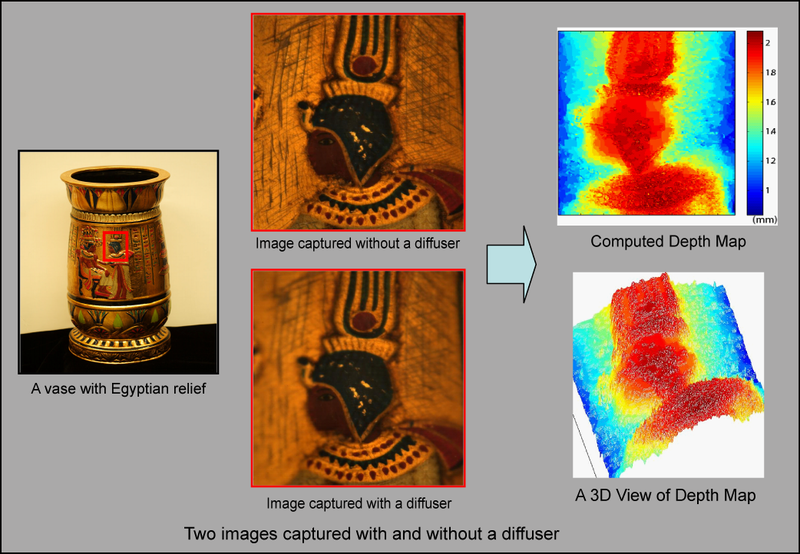 DFDiff results for a thin Egyptian relief on a vase. A Canon EOS 20D camera and five degree Gassian diffuser were used. DFDiff results for a large 650mm x 450mm sculpture on a curved surface. A Canon EOS 20D camera with a 50mm lens was placed 2000mm from the object. 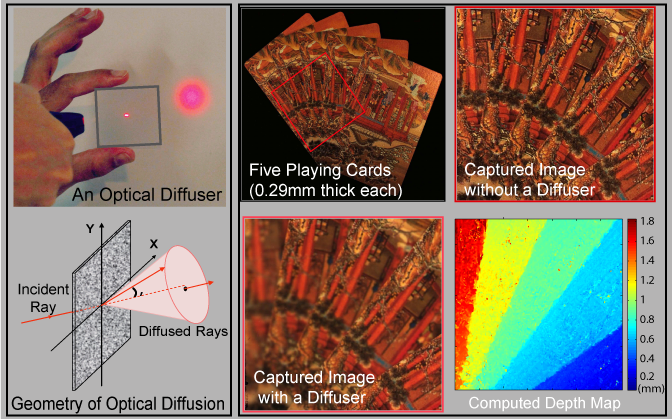 Ten diffused images were captured by swiping diffuser over the surface.